Notably, even with the low price, AMD isn't holding back on feature support here. Since the CPU is drop-in compatible with AMD’s 300 and 400-series platforms, systems based on the CPU will support high-performance NVMe SSDs, USB 3.1 Gen 2 interface, 4Kp60 display output(s) and so on. As an added Insentif, AMD’s AM4 platforms also support DRAM overclocking and an upgrade path all the way to eight-core Ryzen 7 CPUs. 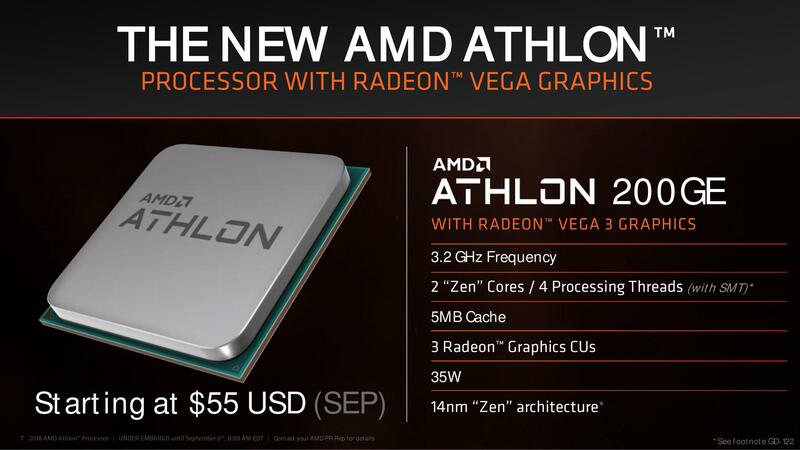 While AMD has formally started to sell its Athlon 200GE processor, its actual availability is a bit of a mixed bag. In the U.S., the Athlon 200GE can be pre-ordered for $59.99 only from Newegg. Other stores may follow shortly, but right now the chip is a rare animal in the U.S. The processor is more readily available in the U.K., but prices vary greatly from £50 to £73 ($65 – $96). The situation is much better in mainland Austria and Germany: the Athlon 200GE can be purchased from multiple retailers at prices that make sense. Meanwhile, Amazon seems to overprice the chip in France and Spain.